For a more child-friendly option, omit the rum from the sauce. In the frying pan, gently melt the butter and then add the sugar and stir continuously until the mixture begins to bubble and all the sugar dissolves then add the rum to the pan to deglaze. Meanwhile peel and cut the banana in 2 cm sections, then gently place the banana pieces upright in the pan, ensuring the whole base of the pan is covered with banana. Drizzle with a little lemon juice. Roll out the puff pastry and cut out a disc to fit the top of the frying pan - this will not be the same size as the bottom of the frying pan! 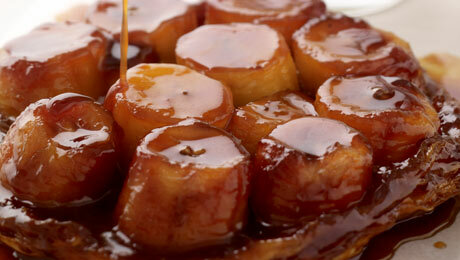 When the banana mixture has cooled slightly, fit the disc of puff pastry onto the top of the caramelised fruit mixture. Remove from the oven and allow to set for 5-10 minutes. Take a large serving platter, place it on top of the pan and turn it over to reveal a glorious pastry case laden with caramelised banana.